I arrived to find the cable of my odometer snapped, which meant I had no way of telling how fast or how long I was riding. A setback, to be sure. But I was already there and figured I could just ride to the best of my ability and enjoy it all. 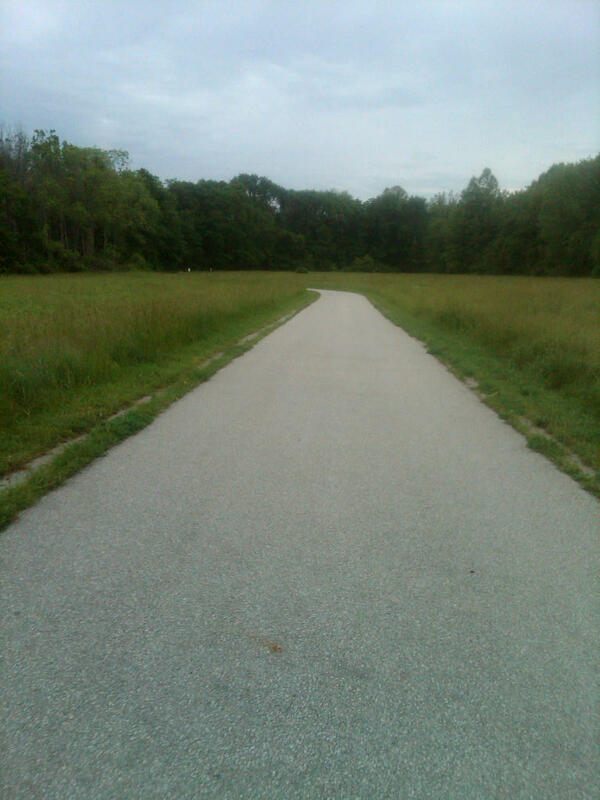 In front of me I had watched a runner veering towards the middle of the path. Protocol dictates runners on the right, bikers on the left. By the time I was close enough to announce myself, she was fully in the middle of the path and still moving to the left. I had to make a split-second decision of how to pass her, so I announced, "On your right!" She looked back over her shoulder and started veering back towards her right. I slowed enough to go around her on the left, saying "ok" as I did. She, in a very aggressive tone, responded, "YOU are supposed to go on my LEFT". Over my shoulder, I replied, "Yes, but you were in the veering towards the left and I didn't want to hit you..."
Turns out, I wasn't there to practice speed that day. I was there to practice something else entirely. Thoughts swirled in my head of how rude she was, how it was her fault she was running in the middle, of everything that I could say to her or the looks I could give on my return ride (knowing I'd be passing her face-to-face on my way back). For the next mile, I struggled. I wanted to be kind. It didn't matter who was right. I have been a runner on that trail before and it is quite easy to get startled by the bikes whizzing past. I kept thinking thoughts of love, how she is a person with a life, how she might have kids at home who call her mom or others who love her. But so much of me wanted a fight. So much of me wanted to be right. Sure enough, on my way back I saw her far down the trail. Thoughts quickening, as in a heated argument, I tried to decide what to do. Ignore her? Snarkily say, "on your LEFT"? Stop and have a long conversation explaining how I was right and she needs to stay to the right? Before I knew it, there she was. I raised my hand in a wave, said, "sorry again", and smiled. (An instantaenous thought of "where the hell did that come from?!" swept past my mind) The determined, angry pursed lips on her face loosened. She raised her hand in a wave and whoosh - we were past one another. Suddenly, I was back on my bike, present to the ride I was having. It doesn't matter who was right. It doesn't even matter who was more kind. All I know is that I felt immediately better after our second interation. In another circumstance, on a worse day, I might have frowned at her as I passed the second time. I know neither of us would have felt peaceful after that. Truth is, this post has little to do with what I did or did not do today. It is a reminder - for all of us - that the practice is ALWAYS NOW. It doesn't matter if we think we are practicing for speed or health or our job...the practice of life flows through all of it. We will find ease-ful ways of living then slip back into hardship. We'll make choices we celebrate and some that make us want to stick our heads in the sand. Over and over we remember and forget - that's why it is a practice. Every second, every instant we have the choice to be kind - to another and to ourselves. We have the choice to participate in our life or just let it whiz by after a complaint or two. Either way we'll make it to our death bed. I think I'd rather enjoy the ride.